Saint Germain des Prés is a neighborhood located next to the Seine river, in the very heart of Paris. It’s one of the most historical districts of the city, famous for being the center of the intellectual world in the 40’s-60’s with the existentialist movement. It also hosts the National School of Fine Arts, deeply linked with artists like Monet, Delacroix or Moreau. 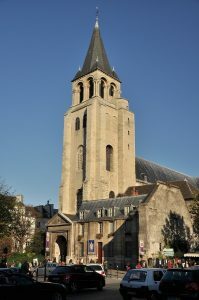 The neighborhood takes its names from the St. Germain des Prés church, at the center of the district. One of the oldest churches in Paris, it dates back from the 6th century. After the Vikings burnt it in the 9th century, the church was rebuilt a second time in 1014 and still stands nowadays. It’s public and open to visits. What really gives its atmosphere to the district are the numerous cafés and restaurants, some of them with funny names such as “L’Enfance de Lard” (which is a pun in French), where you can sit at the terrace in summer to watch the lively district, or take a hot meal in winter to contemplate the night falling on the Parisian streets. In the 40’s-50’s, there were also a lot of jazz clubs in Saint Germain des Prés, but most of them closed in the 60’s when jazz began to be replaced by rock n’ roll. 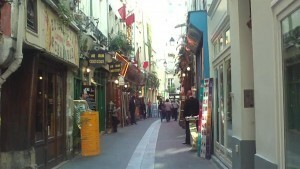 Saint Germain des Prés is also home to numerous art galleries and fashion designer stores. Wandering in the streets, you will also discover a lot of trendy and upscale shops for food (the famous macarons brand Ladurée among others), and for fashion and jewelry (Louis Vuitton, Christian Louboutin…). You can also visit the Saint Sulpice church, second largest church of Paris after Notre Dame cathedral. This church became worldwide famous following the publication of the Da Vinci Code novel, in which some of the clues to follow the treasure hunt are supposedly hidden in this church. The book was such a hit that after its publication, the diocese had to display a note in the church to explain to tourists that the novel was a fiction and that they should stop asking the priests about the fictional pagan origin of the church and other literary inventions of the author! Lastly, if you like to experience the Parisian gastronomy, don’t miss a walk in the St. Germain market, where you will find gourmet and specialty shops. As mentioned, a visit to the St. Germain church is really worth paying to begin your visit, as it’s part of the Parisian history. 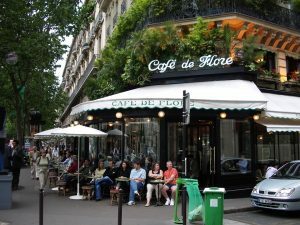 Since the district was one of the world’s main literary centers around the 50’s, with the existentialist movement, cafés like “Les deux Magots“, “Café de Flore”, “Le Procope” or the “Brasserie Lipp” are among the most popular places to go get a drink as many writers and intellectuals like Jean-Paul Sartre, Simone de Beauvoir, Hemingway or Picasso used to go there. But keep in mind that when taking a coffee or a tea there, you will not only pay for your drink, but also for the fame of the place… Some less known brasseries and cafés might just be as nice options. Walking guided tours of the neighborhood are available in order not to miss any detail. But keep in mind that it will tell you about the history of the district and what used to be, so don’t expect to take thousands of pictures as most of the places nowadays do not show anything from the outside. That’s why we recommend you just relax and take time to feel the energy of the streets. Access: Metro line 10, “Mabillon” station, metro line 4 “Saint Germain des Prés” station. Various busses. Located on the left bank of the Seine River, the Quartier Latin is the students’ area. 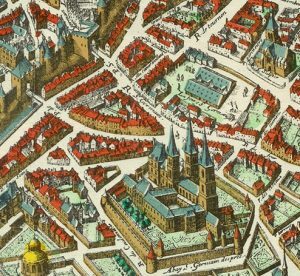 This quarter has this name because the universities taught in Latin up until the 17th c. Nowadays, this old, but lively district still is frequented by many students who attend the famous universities nearby. Historically, the Latin Quarter has been the university area of Paris. The Sorbonne University is located there, which is one of the oldest universities in Europe, founded in 1253. The district became a students neighborhood after the foundation of this university. In addition, the youth lifestyle of the students living in the district creates a unique ambience. Bookshops, bars and cafés can be found in almost every corner of this neighborhood! While going for a walk around the district, you will be able to find the Lutetia Arenas, which was a place designed for gladiator fights and the Thermal Baths of Cluny, which were Roman baths founded in the 2nd century. 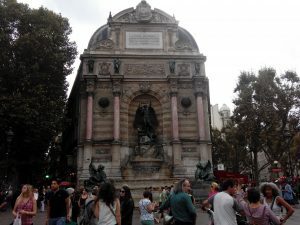 You can also find the Fountain Saint Michel, which is often the students’ meeting point, and the Panthéon, which was the first big monument built in the city. As the Roman Empire occupied these lands for a long period of time, you will be able to easily find Roman ruins and parks. You can go for a walking tour by yourself but be sure not to fall in the tourist traps around the pedestrian streets: bad quality restaurants, tacky souvenir shops… During your tour of the streets you will be able to discover the main historical sights (Panthéon, Thermal Baths of Cluny, Fountain Saint Michel…). If you like museums, you cannot miss the Cluny Museum, the museum of the Middle Ages. 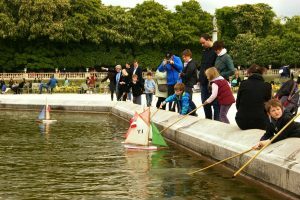 If you are a history buff, you can also take a guided walking tour of the Quartier Latin, which will allow you to discover more anecdotes about this district. After the tour, do not hesitate to take a well deserved snack or a café (a coffee) inside one of the most lively neighborhoods of the Paris. Hours: Lively all day and night long! RER- “Saint-Michel – Notre-Dame” station, lines B and C.